The Unist’ot’en camp in North-Western British Colombia, Canada, has since 2011 been maintaining a check-point to control access through their territory to stop government and industry plans to build several gas and oil pipelines. These pipelines form part of an energy corridor that will serve to unlock the vast energy reserves of the tar sands in the neighbouring province of Alberta and transport fracked gas with disastrous implications for the communities, local habitats and climate. The camp was established to oppose these projects, to defend the sacred headwaters, the salmon that spawn there and to maintain their autonomy. A video from the EJOLT network, a research project for environmental justice of civil society and academic groups, reveals how the Unist’ot’en camp is succeeding in their struggle and keeping millions of barrels of fossil fuels underground. As of Fall 2015, the camp continues on high alert amidst multiple incursions from the companies trying to build the pipelines. 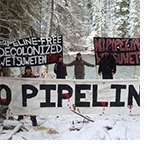 As this video highlights, the Unist’ot’en form part of a networked “corridor or resistance” of justice movements who are increasingly willing to take action to oppose extreme energy projects and who are building energy sovereignty from the ground up.